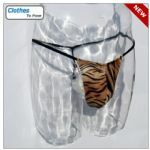 Welcome to our extensive range of Men’s animal print swimwear. We have leopard print, tiger print, zebra print and more in many men's swimwear styles such as thongs, Speedos, swim trunks and g-strings. All our animal print swimwear is tailor made in the UK.